The Apostle Paul was facing severe criticism. It came in the form of comparison between his apostleship and the popularity of the super-apostles. There is something dastardly about expressing our preferences which is little more than our self-indulgence on ourselves and the over-estimation of our value on our own opinions. One of the criticisms leveled against Paul was that he did not ask for or send an invoice to the Corinthian believers for his services in ministry. He never asked for a fee and others took advantage of that by not paying him or paying him poorly. That modesty on Paul’s part was not a sin but a humble act of generosity on his part for the benefit of those who gained from his service. Paul just did not want his personal needs to be a distraction to the Corinthians. Instead, he did with less and never wanted to be a bother. The teaching of truth was paramount, not his personal comfort. This selfless expression to believers who did not give generously, was an expression of love. Those who represent God on earth have only one motivation and that is the highest form of selfless love for those they serve. False self-imagined leaders are not about love but only about their own overestimate of their own opinion. As odd as it is there are false teachers who fleece believers and unbelievers alike in order to obtain selfish gain. Duping people is a gratifying experience for them. Satan Himself is a one who disguises himself with apparent good and love but is evil and wicked. Any humans who attempt personal gain as an imitation minister deserve God’s judgment. Righteousness is a valuable pursuit when the matters of eternity at stake. But, God knows the actual score and will judge all according to what is true. Popularity is not the final test of what is valid. In my city of Houston we have some massive churches with tens of thousands who gather in their facilities each week. Popularity is certainly NOT the litmus test of truth here among some of the largest churches in the country. Jesus and He alone is. My bicycle route was now in the return mode. I had passed the half-way point and turned my wheels toward home. The steady turn brought me across four lanes of traffic during an ideal time when there were no vehicles any where in sight. Then, my eyes caught an unusual sight. The last time I rode this route, just a few days ago, did not have these landscape highlights. My pedals stopped rotating. I glided to a halt and smiled. It was time to dismount and check out this sight. A grin broke out on my countenance and thoughts of Fantasia played through my memory. Dancing mushrooms to Asian music long live in my mind. On the Disney silver screen that image highlights the surges of a classical musical and animated masterpiece. Now, these wild mushrooms brought back those favored moments. The shape of these little guys stood out on the lawns of my neighborhood. 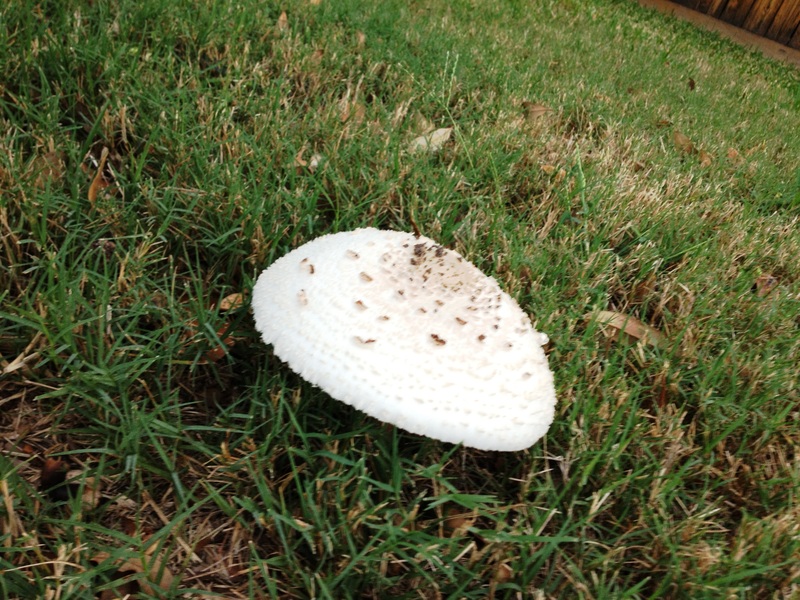 While green grass spread out for thousands of square feet, a few fast growing mushroom are a striking contrast with their stunning bright white caps spread out. Each one is textured with soft skins speckled with decorative brown spots. Almost like a lightly barbequed marshmellow, these fungi make most people look who drive by. The caps of these shrooms have come full spread. Underneath, the gills have opened up and spores are being released. Another generation of these fast growing, suddenly-appearing unique life-forms will appear in the future. These subjects for my cellphone camera were cooperative. They did not move nor did they wave or flutter in the morning breeze. But, they live very low to the ground. Modestly, they hold their skirts low on the lawn. Nothing underneath these mushrooms was visible to my lens. I took as low a posture as was physically possible but there was no new perspective to be gained. I stowed my camera and mounted my bicycle. Pushing off and gaining ground toward home, my memories remained fresh. There is something special about the world of God’s creation around us. He is the Master creator. There is variety in His design. Beauty in the greenery of man-manicured lanscape bends to the emerging of fungi, carried by the windborne spores. It is a domesticated world in the suburbs. But, a twinge of wild unscripted growth still finds its way into the neighborhood. Gentle, cute, fun are words that surround these tiny forms of life. Like all people who have lived or visited the Autumn woodlands of the north, trees turning color in October is a memorable treat. When God turns on the palate of colors, He knows how to wave the brush of creation and put on a show. And it is free of charge. Maybe deep down inside I missed those Michigan Fall days. 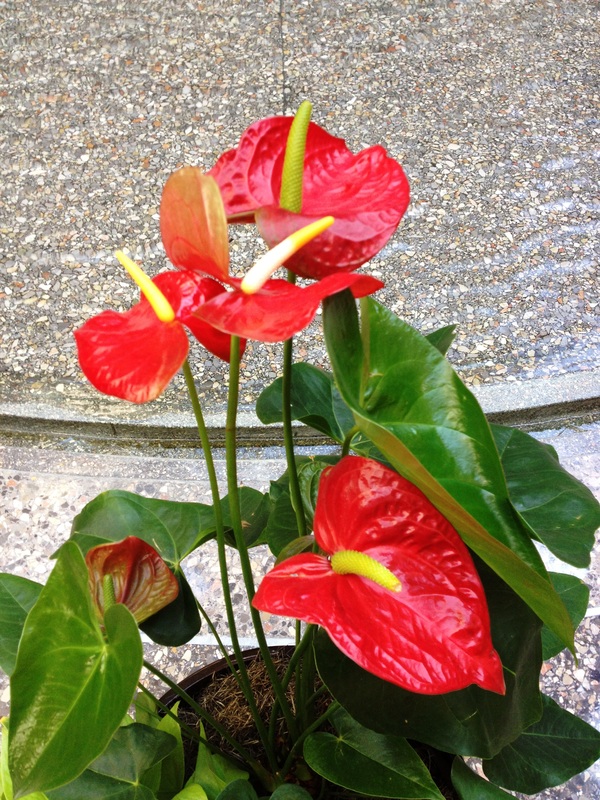 The slow conversion of greenery to splendid splashes of orange, yellow and red are vividly etched in my mind. Further, the donning of a wool coat, knitted scarf and comfortable gloves mean that it is time to take a trip to the Cider Mill. We chomp on a cinnamon doughnut, sip hot chocolate and settle in to storing apple cider for the months of cold weather that are inevitably a part of the season of Winter. The fire-place gets used. Snow throwers get a once over so that they are ready for the blast of blizzards. But, those details are all in my past. Now, I’m a Texan. In Texas the leaves don’t put on a show for us. There was a hole in my being from those happy memories from the northern regions of the Great Lakes. Maybe that’s why I burst out into smile. In front of me in a massive variety store was the Christmas display. Colorful decorations were sorted and piled high. Every symbol of this special season was some where to be found. Ribbons, candy canes, deer, snow men, nutcracker, globes, candles, stars and santas were in bountiful supply. But, the Christmas tree display is what caught my attention. 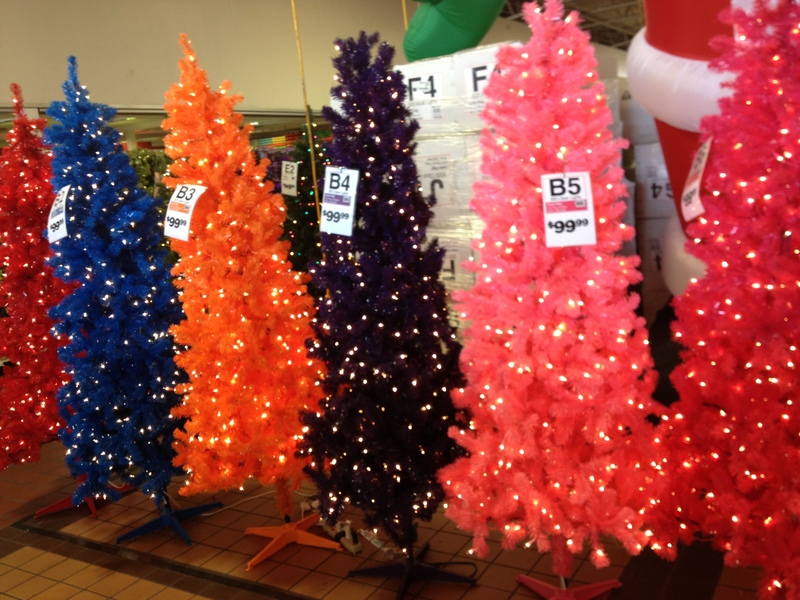 They were lined up in their splendor, inviting shoppers to take them home for the holidays. I chuckled at the variety. No, it wasn’t that the trees were tall or short, wide or narrow, full or thin. Rather, it was the color that caught my eye. It was not quite the same as the natural Fall foliage of the deep woods of state between the Great Lakes. But, for a brief moment they were at least a reminder of happy days gone by. Yes, I finally acknowledged the green trees. The pink one made me shake my head. But, the orange tree grabbed my attention. Blue and red and purple were stunning too. 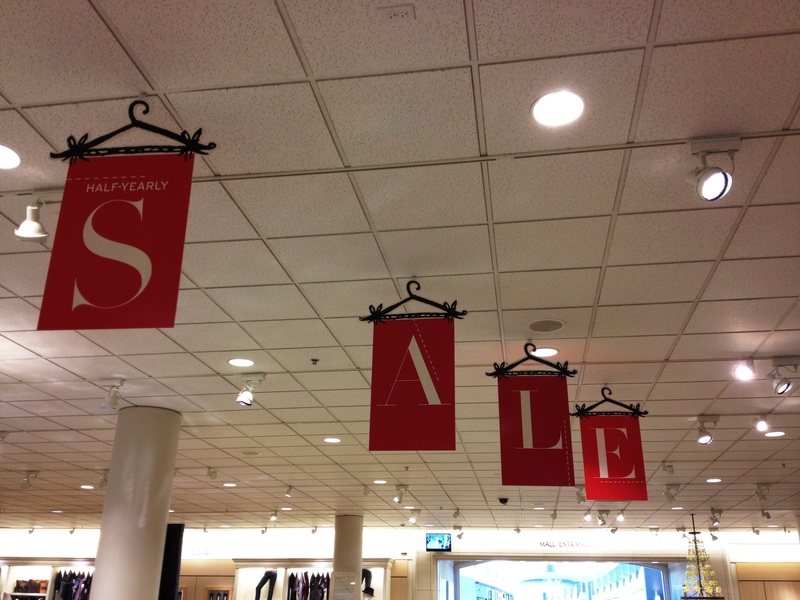 The merry in Christmas is easily fulfilled in this shopping display. That special day to celebrate the birthday of our Savior in on its way. Soon it will be Christmas! Aquariums fascinate me. Life underwater, especial in the world’s seas is intriguing. There is something about the endless variety of sea life that make me marvel at the wonder of creation. 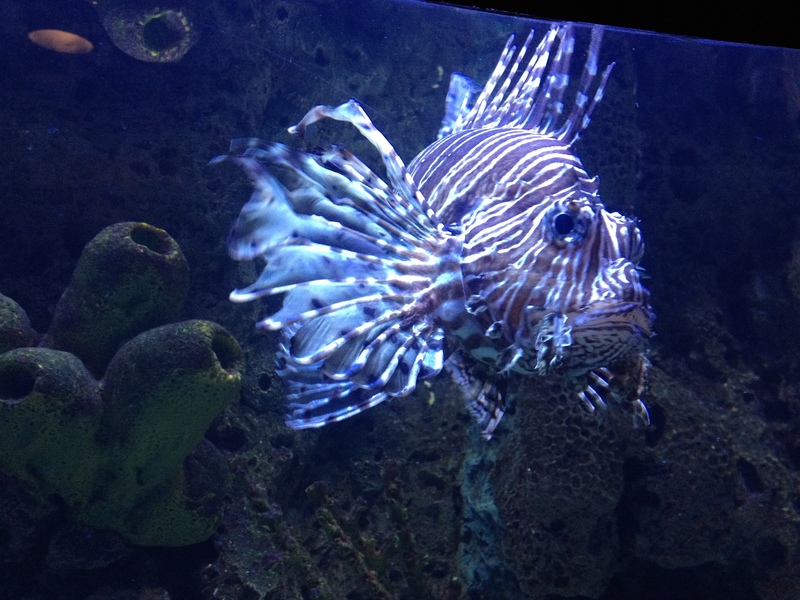 When I wander through the maze of aquarium tanks and exhibits, it never fails to amaze me at the attention that Lionfish generate. There is usually a crowd around their display. You can hear the people “ooh” and “ah”. 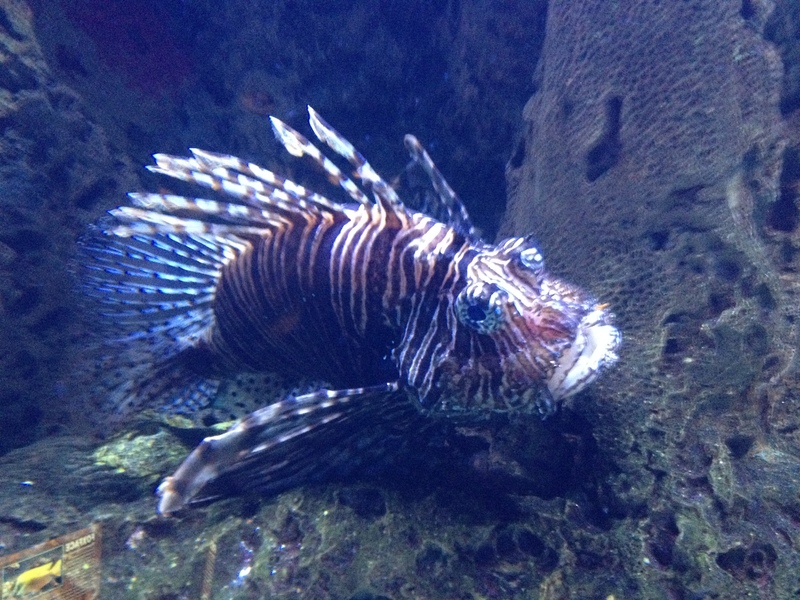 Parents tell their children, “I saw these Lionfish that last time we were scuba diving. They are beautiful but dangerous.” Unmistakably identified by their reddish and white stripes, Lionfish are worth a long lingering look. While beautiful, they are also venomous. The toxin in the stinging fin rays of his animal will commonly be painful, cause nausea, vomiting and result in a fever. This fish’s sting is particularly dangerous to the young or the elderly. Death can occur especially among those who have a weakened immune system or allergies to the venom. Chest pain, difficulty in breathing, low blood pressure and speech slurring are common symptoms of a Lionfish sting. An encounter with this deadly fish will not go away on its own. Medical treatment must be sought. Inside a fish tank, its beauty can we appreciated by all the visitors who never venture into the world below the seas. These ornate creatures swim with purpose, slowly while on the prowl. Then, with swiftness that will surprise any who are lulled into a lazy tracking of this highly adept predator, are startled when this animal attacks for a meal. They jettison streams of water to disorient their prey. Gaping mouths open and inhale their prey in one swift motion. This fish can position itself with great precision to best dominate their next meal, then move back into a casual holding pattern. With the light so low, it wasn’t easy trying to photograph these amazingly attractive fish. I would have to angle the picture correctly to avoid a flash reflection. Then I would hope that the Lionfish would cooperate and not move during the exposure. No one like a blurry picture. Salt water is naturally hazy too. People bump in these tight quarters as well. Kids run and collide with other kids and shoving makes many a steady photographer’s arm move at the wrong time. But, patience, concentration and God’s moment of blessing prove to be part of my first visit to the Houston Aquarium. 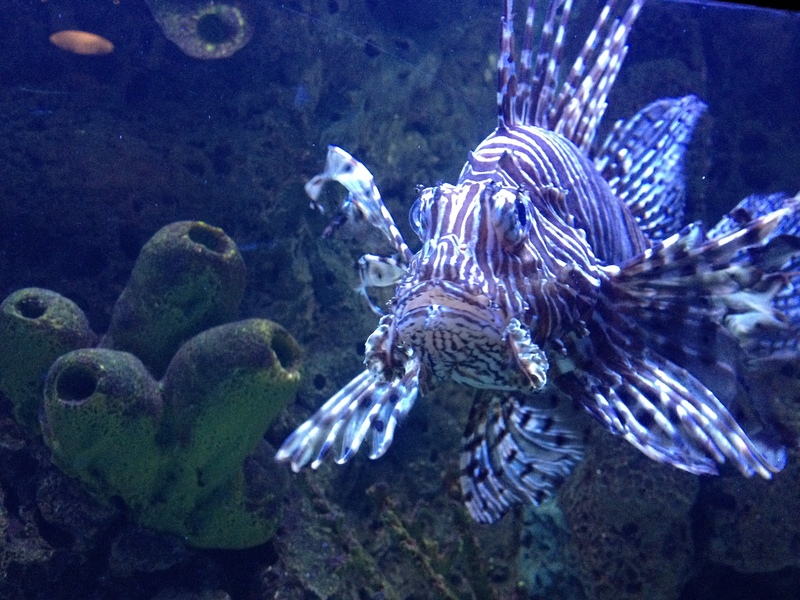 I like these photos of the Lionfish. It is stunning and deadly; so fascinating! We exchanged emails. Our schedules in our active travels were going to cross in California. We first started our friendship in San Francisco and that’s where our paths would cross again during the Thanksgiving season. He and she would be travelling in from New York. It’s an adventure for them in their new life in the Big Apple. I was eager to hear about their new discoveries. She would be coming in from Hong Kong. That bustling city is still on my “must visit” list. I hear so many intriguing stories of that ancient Asian destination that I have got to go and bring my camera with me. Providentially, we all had a free lunch and exclaimed with glee. Of course we saw each other at worship on the Lord’s Day. There we had our hugs and reunion, albeit briefly. We knew that we would catch up the next day. Our destination was downtown. In the congested streets of San Francisco, my bride and I jumped off the interstate after negotiating the Bay Bridge traffic and then fighting the downtown traffic in the city. There were as many people, bicyclists, motor scooters, buses and taxis to dodge than “regular” cars. Tight quarters, massive construction, emergency vehicles, double-parked vehicles and delivery trucks filled the streets and impeded progress. Aggressive moves by drivers cutting in front of me, crowing intersections after the light turned red and stopping to let out passengers all add up to anxieties that only a big city can create. But, hanging out with friends who live thousands of miles away is worth the effort. 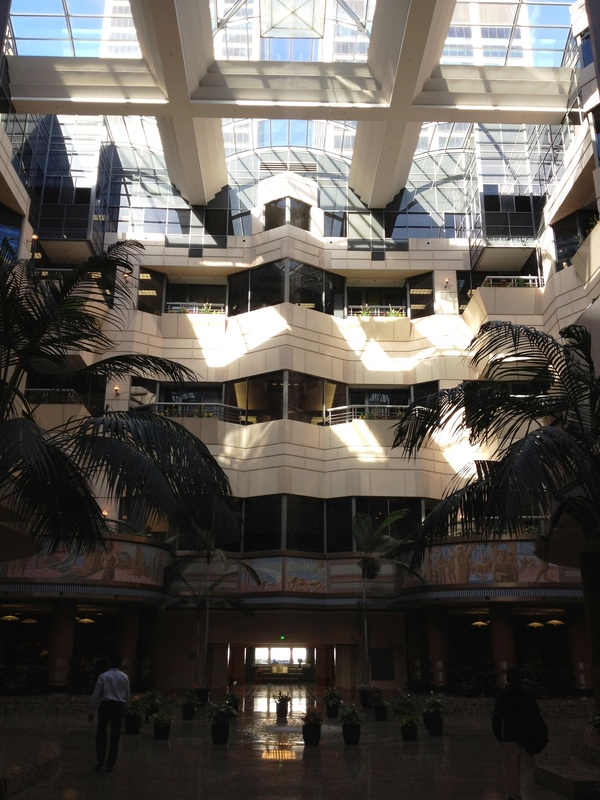 We were surrounded by the posh decorations of well designed building. Water features, exotic flowers, polished metal trim and aromas of eateries getting ready for the lunch crowd filled the air. Then, our friend showed up and smiles washed away all distractions. Together we had an endless conversation about our new life adventures in new cities. It was fascinating, nearly enough information for a channel travel station to do an entire episode. The hunger to travel was ignited again. We exchanged invitations to visit our respective cities. They were real expressions of hopeful reunions again where life and friendship could be renewed. We laughed, we learned and we deepened a devotion that friendship affords. Yes, we are Facebook friends. We will keep in touch via the world-wide web when miles can’t draw us any closer. Oh, yeah, we ate some good food while we visited too. School is now in session. Today we have a test. Our subject for this class is spelling. Many of you have studied very hard for this exercise and I know that I will be very proud of you. Do not be anxious. Just relax and consider the word that I will ask you to spell. Don’t over-think yourselves or guess too quickly. Some of the words may be obvious. Other terms may be a little more difficult. You are welcome to ask clarifying questions but they are limited. You may ask for the word to be pronounced again, which I more than happy to do one additional time. I will enunciate clearly for you. Also, you may ask for the origin of the word. I will tell you the best answer from recognized sources in my possession. But, the answer to the origination question is final and may not be disputed. One final help that you may request is for the word to be used in a sentence. Again, this may only be asked one time so pay very careful attention if you request this helpful clue. All of these sentences are pre-planned but there is only one usage sentence for each word in today’s spelling contest. It is now time to begin. Will everyone please put all materials away so that we can all be confident that our exercise today will be carried out with the greatest care and honestly engaged. Very good, we are ready to begin. Based on the earlier lottery, we begin with Kristin Bailey as our first contestant. Young lady will you please come up to the stage? Yes, now. No, you may not bring Oscar with you. Please leave him with your mother. That’s it come on up. Now, please spell the word. “S-A-L-E” No, I’m sorry that is NOT correct. You are eliminated from the competition. No, you don’t have an appeal. No, you did spell the word incorrectly. The word is spelled T-R-O-U-B-L-E. Yes, I know it looks like the word S-A-L-E but it is not. Your wrong so please take your seat. Hey! Give me back my wallet! You little crook! What do you mean you’re going to a SALE! Give me my credit card back. Stop making TROUBLE! We chose the Grand Palace of South San Francisco. Everyone knew where it was located. We climbed into our various vehicles and started our engines. Text messages scattered and others who were on the road received an update of our family rendezvous. We had come the furthest, about 2,000 miles. It was a good enough reason for other family members to convene too. It’s the Thanksgiving season and everyone is thinking about family. Nothing draws family together like food. For the Fong’s there no better cuisine to do the drawing than Chinese food. The restaurant was not too busy. Our party of twelve easily found a large round table. Several of our family know the manager and several of the wait staff. It was a reunion of more than just family members. Those who have the connections jabbered away in the premier native tongue. Enthusiastic gestures and laughter spiced up the ordering process. A few outsiders shouted out menu preferences. When the staff departed our family shared pictures of the last four months. Stories of travels, choices, recommendations and news filled the table and everyone was included. Then, the feast began. These gatherings deserve special menu selections. This night was one of those special occasions. 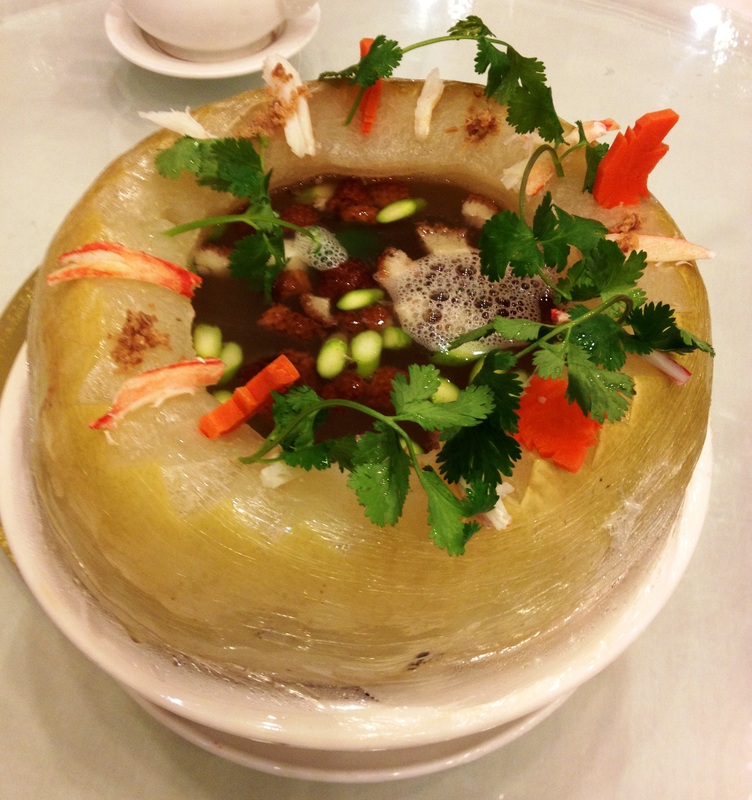 The waiter delivered a winter melon dressed and presented in its finest form. On a cool November evening, this hot soup served in the actual melon is the best comfort food we know. It is rich in vitamins, nutrients and flavors. Each portion of soup was served by an experienced waiter. He scoops a ladle full of the melon with each bowl served to all of our members. 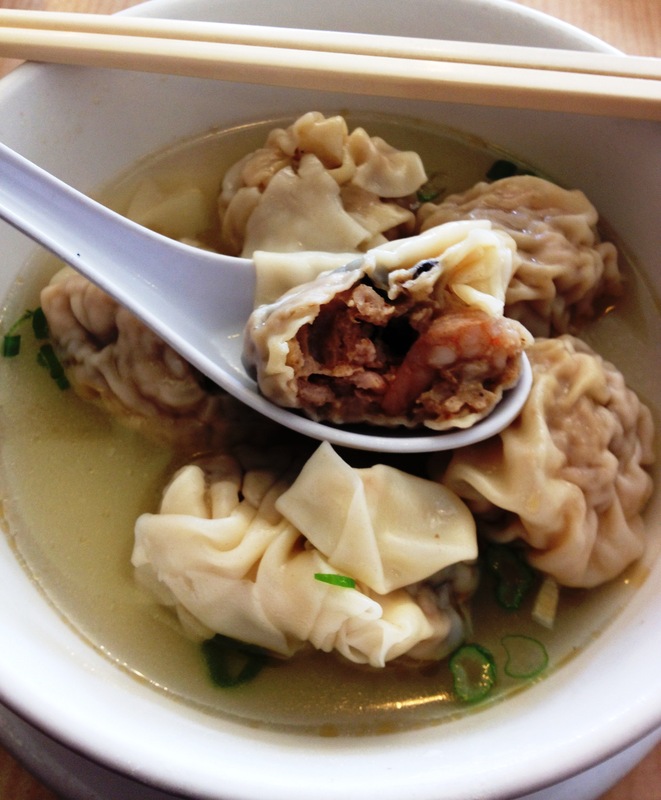 Steaming with aromas that calms the soul, I smile as I dug into my serving. No one is shy in our family. Anyone who wanted a second helping freely helped themselves. There was plenty to go around. Next, the waiter brought a spectacular dish and set in on the lazy Suzan with panache. 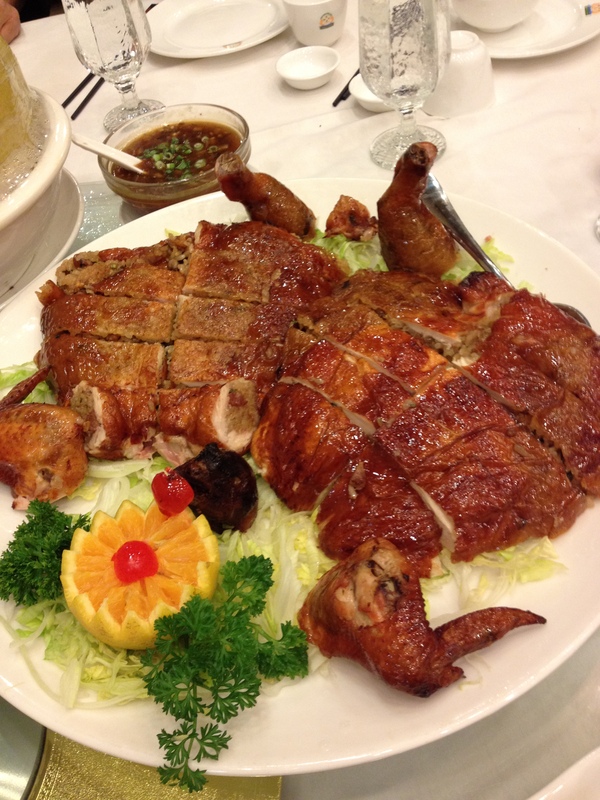 It was roasted chicken, cut up and laid out over a deep be of sticky rice. This alone could be a meal in itself. Everyone oohed and ahhed over this delectable dish. The chicken melted in your mouth. Aroma of the roasting mixed with the multiple presentations in the sticky rice for an explosion of taste buds around the table. Just the sight of it was amazing. but feeding on it heightened everyone’s celebratory mood. These two dishes was great. But, they just served as the vanguard to a great evening. Our afternoon in the delightful town of Santa Cruz led us on a lazy stroll after a fabulous lunch time meal. 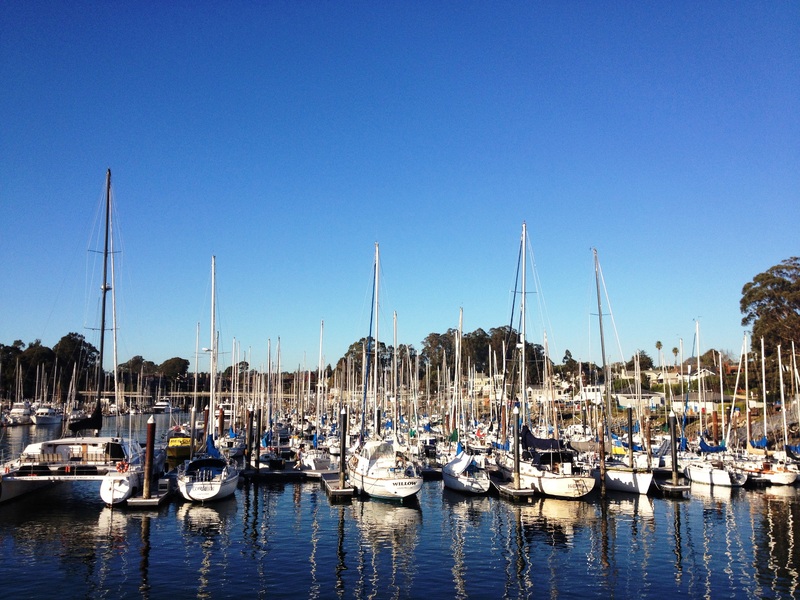 Vistas of the coast, sail boats and sea otters relaxed our bodies. We turned our attention to a local gift store along the port. Before we could enter the shop we had a strange and wonderful greeter. Yes, it had two legs. But, no it was not human. 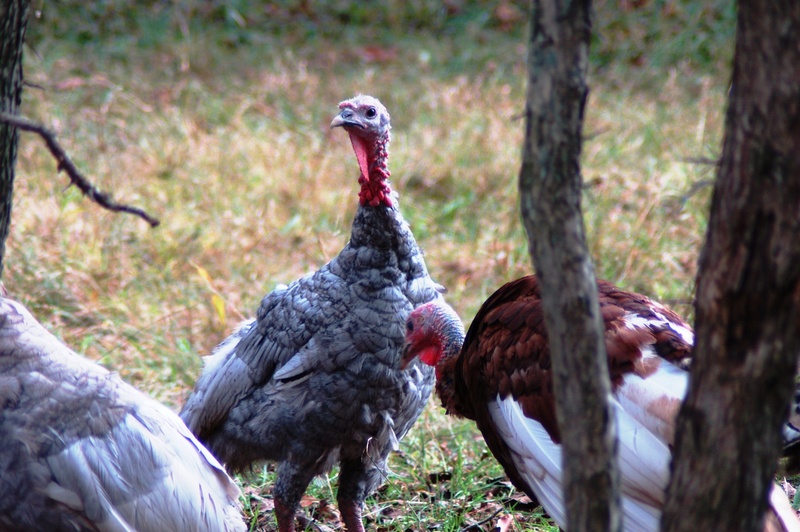 Instead, feathers decked this unusual creature. Its beak is long and its head sustained by a skinny neck. Webbed feet gave it a steady stance. This was a brown pelican. For years I have carried my camera while traversing the sands of many ocean shores. Even on boats and ships that have navigated the coastlines, I have had one camera or another that I pointed skyward but always too late to capture an image of the peculiar pelican. It is one of those common sights that in the back of my mind, I wanted to capture in a number of digital images. Some times this bird seems ungainly and clumsy. But, in flight is soars swiftly and in perfect formation with its companions. Landing is a mess as it splashes down with quite the commotion. Still, those are just memories without even a blurry shot of this remarkable bird. Finally, I was up close and very personal with critter. But, my Nikon was not with me. At least I could use my cellphone and capture this feathery bird on digital file. The store clerk was trying to keep it out of her store. She laughed when I asked her to let me first take its picture. Slowly she gave me a little leeway. 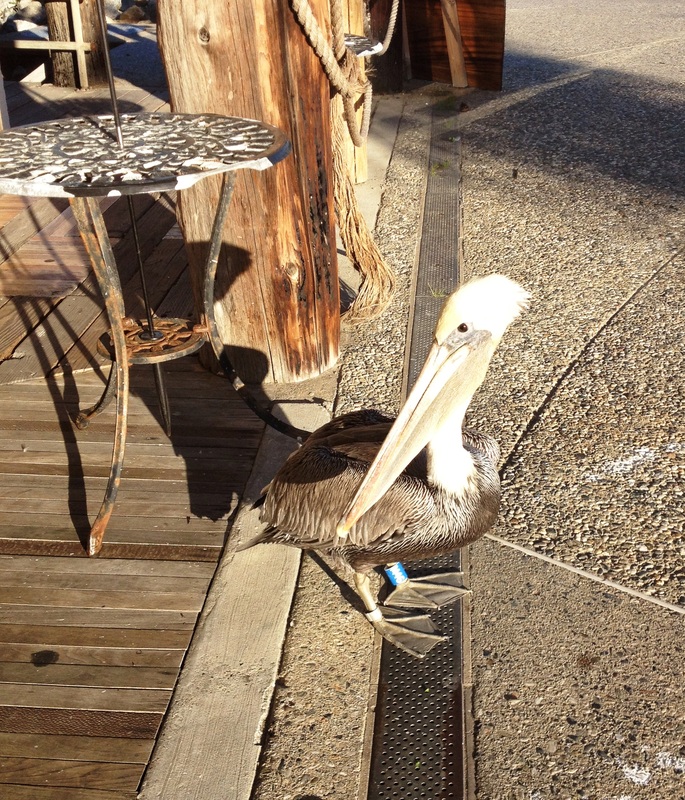 Then, after a few poses, the pelican saw its chance. 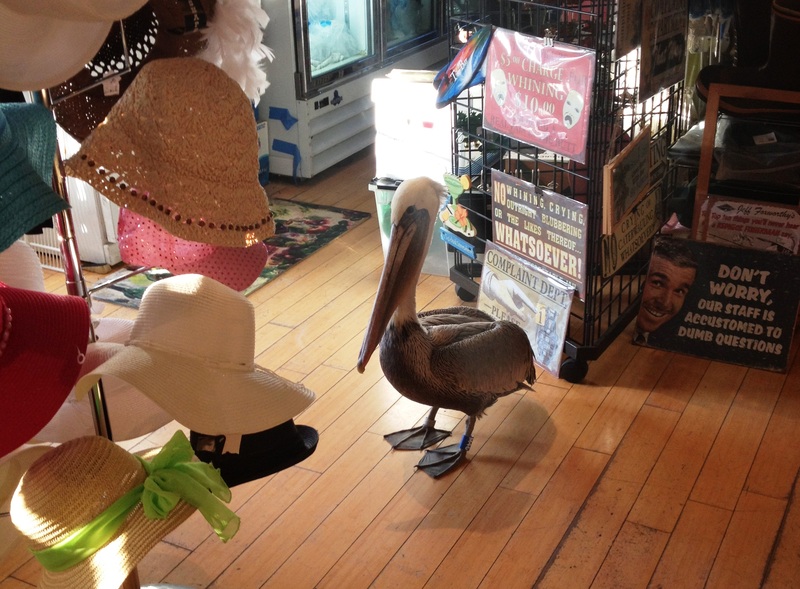 While the clerk visited with me, the bird did a swift end-around on the humans in its way. It waddled through the store. It was hungry and was foraging for food. Many of the fish in the nearby river and ocean have been depleted by the otters. There was no longer enough for the pelicans to harvest. Now, hungry birds were frequenting human establishments in the hunt for sustaining meals. 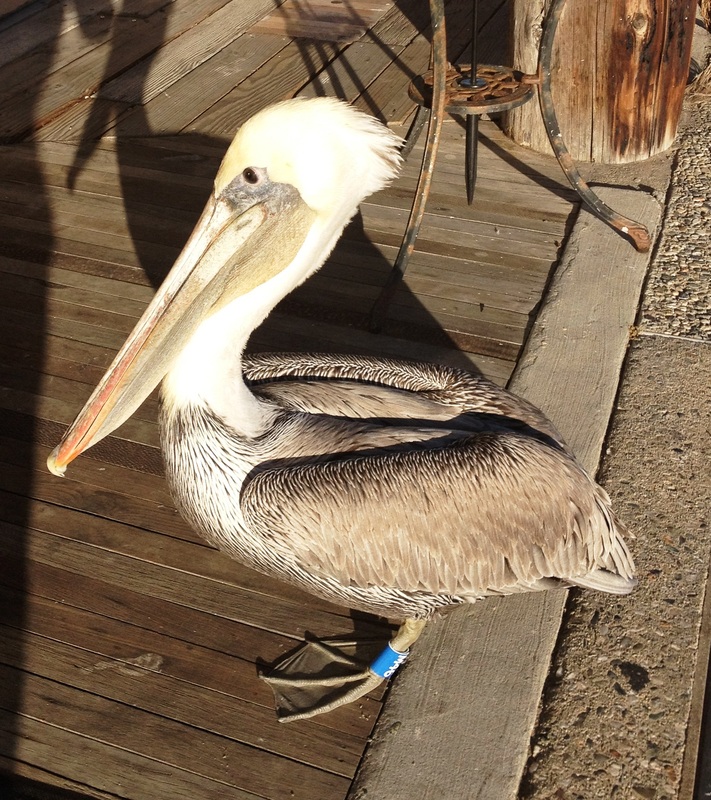 This pelican was not at all threatened by my presence. Hunger does that to most living creatures. The clerk warned me not to get too close. This bird she said was so hungry that it would easily mistake my shiny camera for a fish and go after it. So with my final photo of the bird looking as if it were shopping for a hat, I checked this subject off of my camera-to-shoot list. My earliest memories of a terrific family vacation is Santa Cruz. Our family of six would pile into our ’46 Chevy and motor our way to a cheap hotel with at least two and sometimes three per bed. Good memories of the boardwalk, beach, pier, sunburns and seafood blend together. Those recollections of yesteryear made it an easy choice when my bride and I had a day with no plans and we loaded up our rental car in San Jose. Wow, let’s go to Santa Cruz for lunch and drive up Highway 1 to San Francisco. Sure! We wound our way into traffic on Highway 17. Carefully, we navigated the narrow two-lane road along with thousands of other travelers. While the beauty surrounding me was flying past, I fixated on a safe drive around blind turns, tight turns, big rig trucks and of course the not-to-in-frequent speedy sports car. 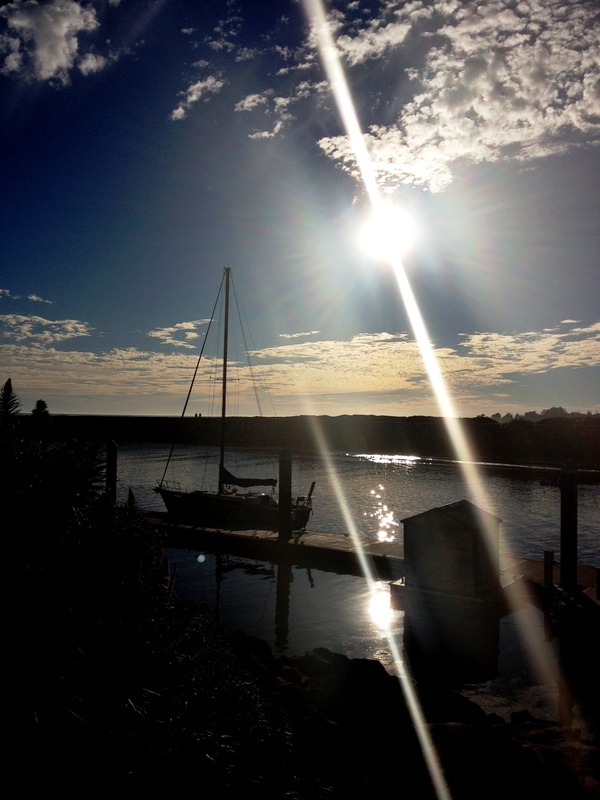 The weather was perfect on this November day. Strong sun rays blasted through the tall stand of firs and redwoods. Blue skies with cotton ball cumulus clouds decorated the skies above the busy roads. Soon we rolled into the parking lot of the Crow’s Nest. There we would dine in the upstairs cafe, advertised as a great view with great food. This was an ad that was not overselling the product. 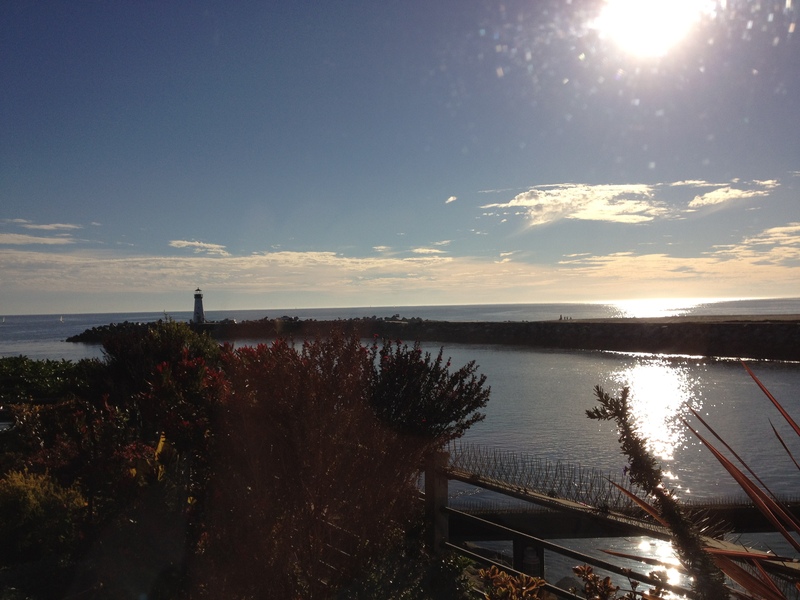 Our table was next to the picture window, a perfect description for our seascape view. The river from the harbor meandered below us. Its waters were disturbed by a playful otter, hungry pelicans, squawking seagulls and several sail boats navigating upstream. In the distance the beaches of the Boardwalk stretched out while the endless surf licked at the sandy strip of land. The famous Santa Cruz pier that supported many of my childhood walks reached out into the salty waters as it has for decades. The sun was low in the afternoon sky. It showered all of us coast lovers with warmth, light and healthy doses vitamin D. Visiting this favored destination of mine was topped by the serving of a delicious lunch. The CN clam chowder is made from scratch at this eatery. It was creamy, smooth and evenly flavored. I recommend it. Alongside were three planks of Alaska cod. 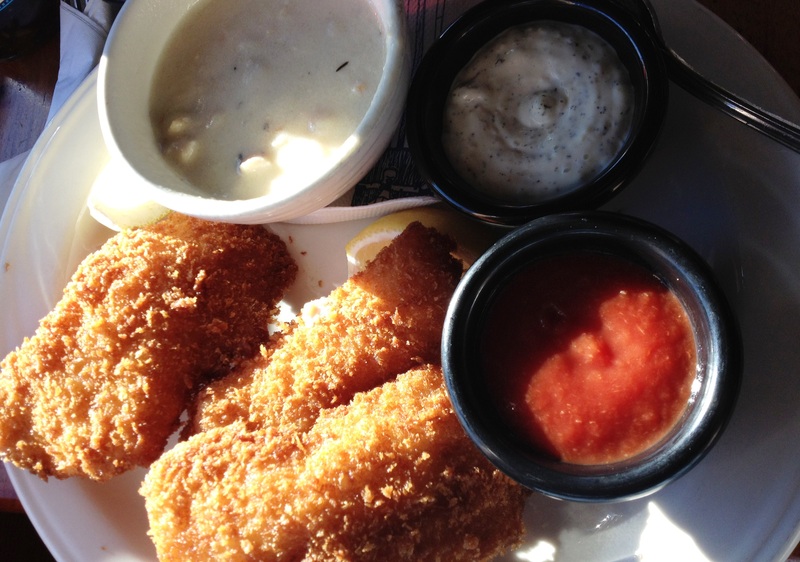 They were dressed in beer batter with excellent tartar sauce. It was fabulous. So many of the reasons that I treasure this vacation spot flood my mine and now just a few I share with you.